Windows 8 tablet of Microsoft comes in two versions: Windows RT and Windows 8 Pro, that have different hardware. Windows RT has a display with a diagonal of 10.6 inches, weighs 676 grams and is 9.3 mm thick. Comes with 32 or 64GB disk capacity, a USB 2.0 port and a slot for microSD memory card and runs on ARM chipset. The difference in Windows 8 Pro version that this tablet offers memory of 64 or 128GB, weighs 903 grams and is 13.5 mm thick, and will have Intel Ivy Brigde. 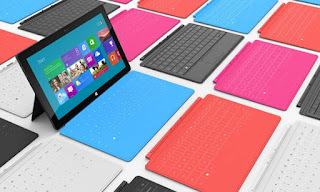 Microsoft also will offer, to the users of the Surface tablet, covers with a QWERTY keyboard who has a magnet attached to it. Surface will be presented to the markets in fall, and its sales will start when the Windows 8 will be launched. The price is not yet known.